20161114 - Up in the am and in to work. Getting things organized and ready for a busy week. Finished my day, headed out a bit early for a meeting. 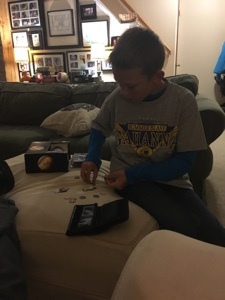 Home and had dinner with the bickering boys and L. D&J were getting ready for Scouts and G counted out his change to see if his gift card plus his change was enough for us to get ice cream :-) D&J headed to Scouts and G&I headed out to return the cable box we used for the party. We got the box returned and then headed to Cold Stone Creamery for an ice cream treat. G's card didn't have as much as he thought it did and I had to provide a financial bailout ;-) We walked around Creekside for a min trying to get some floppy fish Pokemon but didn't find any. On to Scouts where we ate our ice cream in front of everyone. Home for a min, I got Doc and headed out for a really good discussion at Bible Bangers.